what an excellent summary THANK YOU. I got to this site by googling “ereaders uk” – up until then I was getting US sites. After reading this I am almost certainly going to get this for my wife for Christmas 2010. Hi Diane, the Kindle doesn’t have any ebooks pre-loaded. If you want to give a kindle as a gift I would suggest loading the Kindle for PC software on your computer. Login as the recipient (using their amazon login details), buy the kindle ebooks. When the recipient will turns on their kindle the books will appear automatically. Otherwise you can send the recipient an Amazon gift card, or open the package and add a few free kindle ebooks using the device. I would just like to thank you for helping me make up my mind on which e reader to buy. It was a choice between the sony 350 and the kindle 3.I was very impressed with the write up and knowing I don’t have to keep going to my computer to download books is a great advantage. I am not very good with the computer so using one item is better than two. This is a gift to myself so I am looking forward to learning how to use it and of course enjoing reading my books. many thanks. Hi, I also want one and have more or less decided, but would like to know can only Amazon books be downloaded or can you download from the free sites. Yes – You can get free ebooks from the Amazon Kindle store, and upload free ebooks from project gutenberg in PDF format. When you buy it from Amazon, I think it will register the Kindle to your amazon account. 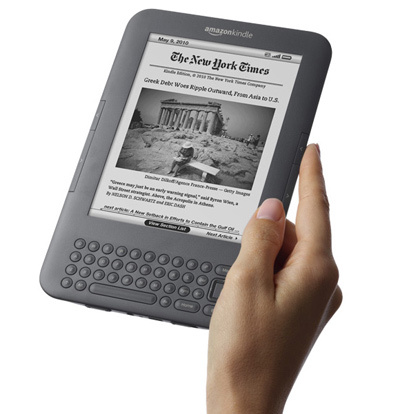 Very impress with yr introduction on Kindle 3 now my question is how i can purchase it frm West Malaysia. Reading in the bath. Obviously I wouldn’t fully immerse this in the water but would it get damaged by regular reading in room full of condensation? hi considering buying the kindle for my husband. how much do the books cost to download ? Between the Kindle and the Sony which is the better machine for enlarging the print. Also iss the sound quality when reading from the text better on either of them. @Carol – Depends if Amazon ship to west malaysia, if not you might need to wait until they do. @Stan – Haven’t tried reading in the bath, but I wouldn’t suggest reading in a room full of steam as condensation will build up on the screen. @David – Both the Sony PRS650 and the Kindle have the same screen, so both would display the same. The Sony can’t do text to audio though, only the Kindle can do that. If you are not technical, I would recommend the Kindle over the Sony ereaders. How does the range of books available between the Kindle and the Sony compare in variety and volume. can the kindle connect to my pc so i can upload books from my pc to the device? 1.When you purchase books on Amazon do they actually reside permanently on the Kindle( until deleted)? If Amazon ceased to exist would your books remain on the Kindle? 2. If you have lots of books on Kindle how are they catalogued/indexed? 3.Does the Kindle have a lifespan or should it last forever? 4. Are there any running costs apart from new book purchases? 1 – Yes, the books stay on your Kindle till deleted. If purchased from Amazon, the deleted books stay on your “Kindle Library” accessible from Amazon so you can re-download them. If Amazon ceased to exist, your Kindle wouldn’t be affected but it’s a good idea to keep a copy of your books on your own PC (then maybe burn them to a DVD). 2 – I don’t know. I have done a lot of research but I’m still waiting for Santa to bring my Kindle! 3 – Obviously nothing lasts for ever. Hopefully, it will last for many years. 4 – Just a little bit of electricity unless you get the 3G version which only lets you connect to Amazon. You might be able to connect to other sites but there will be a charge. Also, if you want your daily newspaper sent to your Kindle, they (the paper) will charge you quite a bit (also copies are deleted after a few days). This is all I found out so far but anyone is very welcome to correct me if I’m wrong. We have a 10GB monthly limit from our broadband provider, approximately how much would each book use? I was wondering about durability. I would really like to get an e-reader, and I have been the most impressed by the Kindle3, but I am worried by a few reviews I have read, about Kindles being flimsy, breaking easily, and having lots of glitches, such as freezing, and blank screen. What do you know about this. I know technology can fail, but if I am going to put so much money into a device, as well as the books I purchase, I want to make sure it is going to be durable, as well as reliable. How quickly do you think prices will tumble for e-book readers? It looks to me that Amazon has started a price-war with Sony (and others) and the result will be good for consumers. @ Jan – If you opt for the 3G you can buy/download as many ebooks as you want. Otherwise, each ebook is usually a 0.3-10 mb in size. @Lulu – I’ve been using my Kindle 3G daily and have not noticed any flimsyness, or freezes. Its a rock solid device. @Rog – I don’t know if prices will “tumble” , but as the E-Ink technology becomes cheaper to produce, more people will be able to afford ebook readers. The Kindles are really good value, I think Amazon are probably selling their ebook readers at near cost with a view to recuperating some profit by selling ebooks. I am an English learner. I would like to know if I could load an Oxford or other label dictionary on this Kindle 3 or any other ereader; also if any techie publication be loaded on any of these ereaders. Many thanks. Can I use a Kindle to read large .PDF and .DOC files of e-journals which I already have on my PC or can a Kindle only display books downloaded from amazon? does it mean the Kindle can not read pdf files, because I already have some pdf books and would like to move them when i buy it? If I buy the current Kindle will I be able to transfer my books when a new model is introduced? What restrictions, if any, are there on other eBooks? I had my Kindle for xmas off my lovely husband and I am really happy with it.As a arthritis sufferer it is light weigth and just ideal for me. I live in Toronto. Will there be download charges if I buy books from a kindle 3 3 G version ? Nice review. I especially like the new price of the Kindle. I liked the idea when it first came out but I was shocked at the high price tag. This new Kindle puts the iPad to shame. I am considering buying a kindle for my boyfriend but was wondering if you can play music from it as with the sony devices? I’m taking college courses online and I’m wondering if I can download the books that are posted within my classroom to the Kindle3? I’m thinking the Kindle might be a better way to read my books without being online. Also, what is the difference in the Kindle with wifi or 3G? How do you download books from your pc? Is it by usb? Can I put music or pics on it? Is it possible to share ebooks between kindles? I am completely new to ebooks and would like to know, Iregularly get national book vouchers as presents, can I use these to buy ebooks from Amazon or other ebook suppliers? I got the Kindle 2.0 shipped from the States to the UK just under a year ago. I absolutely love it – it took about a week to arrive. When Amazon opened the UK Kindle store last Autumn it was really easy to change it over from Amazon.com to Amazon.co.uk. I want the Kindle 3 – but I said I would keep the current one for at least twelve months before I upgrade. That will be next month! On the other hand, I could wait for the Kindle 4 – which based on previous release dates should be out just before or just after Xmas 2011. Decisions, decisions. My library has started “lending” e books,can i use a kindle to download these for free? Just a small problem that is not usually told to people before they buy a Kindle… The screen contrast is rather dark and CANNOT be changed at all, making it difficult to read sometimes in murky or less than good light conditions.. This is the main reason that most people return their Kindles back to Amazon.. Also some people find that their battery life is much, much shorter than the Month that is talked about..This is easily remedied by pushing the sleep/open button to the right for 20 seconds, this resets the Kindle and changes the battery life to the set parameters that are advertised. You can…. (if you are naughty enough) download thousands of books of the mobi kind on the internet and side-load them on your Kindle and they work perfectly…. Hi my wife bought me a kindle for my birthday, got to say it is one of the best presents i have had. So quick and easy to use and set up. I don’t care about only getting books from kindle as the amount of books from kindle is enormouse and you can get books for free from kindle. I am told there is away of loaning books on the kindle but as of yet have not tried this. Also there is a great book club for the kindle run by volunteers for free. Please note: you won’t be able to download e-books from your library using a Kindle. The main reason I don’t have one. great review. If I had read your review earlier, I might consider getting a Kindle instead of an Android. Can I read pdf files containing Hebrew text on Kindle? Thank you for review. Not a techie/computer user so think the 3G may be my way to go. Can children’s books, illustrated books and specialist academic books be bought for the Kindle? Also some commentators have mentioned saving books as disks – is this difficult? how would one get the book for Kindle to disk? This will be mt first e-reader – how does it compare honestly to feel/ thrill of reading paper book? I am an English speaker; live in the Italian speaking part of Switzerland and I do not understand German. Amazon does not allow me to purchase a Kindle in the UK as I am living in Switzerland. I am obliged to purchase Kinle products and e-books through their German website. The only information in English is just basics about Amazon. The detailed information about the product or the books is in German. Should you purchase or receive a Kindle as a gift from the country of your choice when you leave that country Amazon will ultimately stop you purchasing through that Kindle store of your choice You will automatically be re-directed to the site of their choice based on your location independent of whether or not you understand the local language. Kindle is not a good choice for anyone who works outside their linguistic zone for long periods. It is a better choice to have a reader that allows you to purchase e-books in your own language where and when you like.